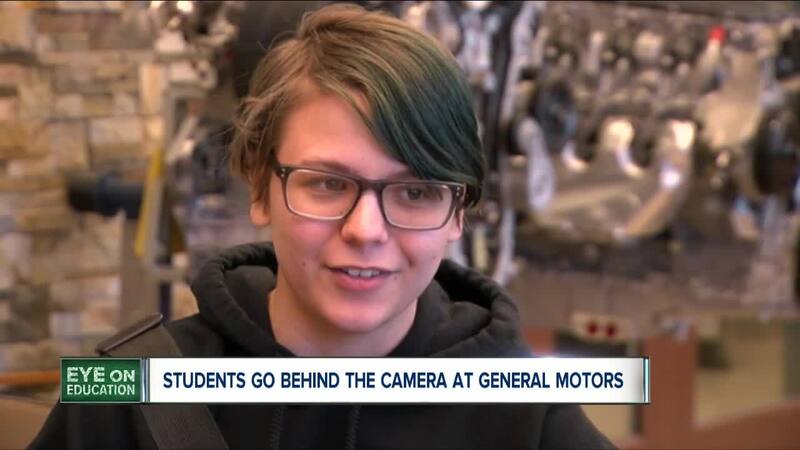 All of the interviews and video footage captured at GM was for a special competition in partnership with the Northland Workforce Training Center. What's so great about manufacturing? You're about to find out, thanks to students and teachers in Western New York. It's all part of a video contest hosted by the Northland Workforce Training Center. Inside the General Motors Engine Plant in Tonawanda, about 10 students from Buffalo Academy for Visual and Performing Arts huddled around what looked like a stack of engines on the factory floor. "Do you ever have too much product?" "Are there places where you have to wear special clothes or footwear?" "How many parts are made here?" All of the interviews and video footage captured on the plant floor was for a special competition, in partnership with the Northland Workforce Training Center. The east-side advanced manufacturing training center invited middle- and high schools across Erie and Niagara Counties to put together videos that answer the question, "What Makes Manufacturing So Cool?" All of the video entries are voted on by the public , before a final round of judging on April 11th. Northland teamed each student group up with a local manufacturing company to learn firsthand about the manufacturing process. "I definitely like technology and just seeing it all out in the field is very interesting to me, and I'm considering it for the future now,” student Natalie Stockmeyer said. At General Motors, some students were enthused by the assembly process, while others were intrigued by the employees who put the engines together. "I think it's different because the people that work [at GM] are not being recognized and I never thought to get in the career of manufacturing, but this [visit] might make me want to do this," student Talaya Rouse said. Rouse's classmate Josiah Ramirez also felt inspired. "I've always wanted to do manufacturing, but now I'm just prompted to do it more,” Ramirez said. Dave Riffell, one of the Performing Arts teachers that has been working with the students on the special project, believes the video competition gives the students a chance to hone skills they will use outside of the classroom. "It was really exciting to see them in action, actually interviewing people, using the skills in the classroom that we go over, but then taking them here to a real world situation, I think is really exciting," Riffell said. The video competition runs April 8-10. You can vote on your favorite video here.